While I will never complain about the amount of films I get sent my way to watch for review it does make it hard to find time to watch films of my own volition. I had been meaning to watch U.K based Don't Knock Twice for a trio of reasons, first as it is a horror that is available to watch on Netflix. The second reason it is an eligible film for the 2017 Fright Meter Awards (of which I am a committee member), and the final nail in the coffin was that there has been a PSVR game recently released that by all accounts is pretty dull, but which I am going to give a go anyway and thought the context of the film might add atmosphere to it. Chloe (Lucy Boynton) and her friend are discussing an urban legend that was around when they were kids; the legend being that if you knock twice on the door of a certain abandoned house in the neighbourhood then it's ghostly occupant will do the same to your door and make you vanish. They decide to show how silly they were for being scared of this as kids by knocking on the house. Much to Chloe's horror (and maybe disgust at how petty this particular spirit is) her friend goes missing that same night. With increasing signs that she is next to be taken she decides to reunite with her estranged mother who gave her up for an orphanage 10 years previously but is now seeking to take her back having sorted her life out. The spooky goings on don't stop though, at first her mother; Jess (Katee Sackhoff) thinks her daughter is making up her tales of being stalked by an evil supernatural woman, but soon she too gets caught up in the events and must find a way to save her daughter from being taken...and unlike certain parents she doesn't have a 'particular set of skills'. Don't Knock Twice is quite a by the numbers generic mainstream horror that to begin with did feel very similar to no end of others (Lights Out and The Bye Bye Man are a couple that come to mind). You have an evil force that follows some arbitrary rules and constantly shows up to cause problems for the main lead but who seems weirdly powerless and restrained from just straight up doing what it wants. This is where I had some of the biggest problems, though to the movies credit it often goes out it's way to explore these potential plot holes, such as the fact that the demonic woman isn't able to just appear and take Chloe due to the love of her mother protecting her from the spirits power. However this evil is kind of irritating more than dangerous to begin with, only causing trouble and chaos when none else is around, the usual horror film trope of no one believing the victim due to scary stuff only happening when she's alone. The demon is unpredictable in how it is able to operate, doors are key and there are some decent moments involving these as anything that opens can be turned into a gateway to the demon's realm. However at one point it is able to use the capability of a phone to prank call Chloe, and take pictures of her, this only occurred in one scene and felt quite out of place as at no other point does it use technology as a weapon of fear. Also I have to wonder how many hapless door to door salesmen or Jehovah witnesses have vanished over the years by knocking on the cursed door unaware of the legend? To begin with this felt like a typical female teen in distress type of horror but with the introduction of Jess the focus shifts from the daughter to the mother and explores her fractured relationship. Coincidentally this is the second film in a week that has starred an ex Battlestar Galactica actor and like James Callis in House by the Lake Sackhoff is a good fit for her role. She doesn't do anything particularly special, but does the mother trying her hardest to make amends with her past mistakes very well. It gives something interesting to her, more so than the pretty bland Chloe, and why it was felt that Jess needed a husband I do not know as he leaves the film on a business trip a couple of scenes after he is first introduced and then is gone for virtually the rest of Don't Knock Twice, he literally added nothing at all and had no bearing on the plot. I was ready to pass this off as another bland horror but the final third is when things really begin to improve, not only in terms of the inventiveness of the horror but in the way the plot flows. There are plot twists I never saw coming (and some I did), yet I enjoyed that at least a few of these huge plot twists turned out to be red herrings. It all ends on a satisfying note that reminded me a little bit of Drag Me to Hell. I don't know why but the final third was a big improvement, maybe with all the silly 'scary stuff only happens when I'm alone' out the way, and maybe that this just seemed a better paced and better directed segment. I really enjoyed the interrogation scene for instance, while the effect of someone getting a nail through their foot made me feel quite queasy which was cool. The demonic woman is usually only seen in the dark and so she didn't really leave much of an impression, though I liked that it seemed her limbs were unnaturally elongated at least, but her disappearing whenever someone looks at her was dumb. I adored the weird music/sound effect used whenever it was around though, sounded to my ears kind of like an animal growling noise but slowed right down (you had to be there). 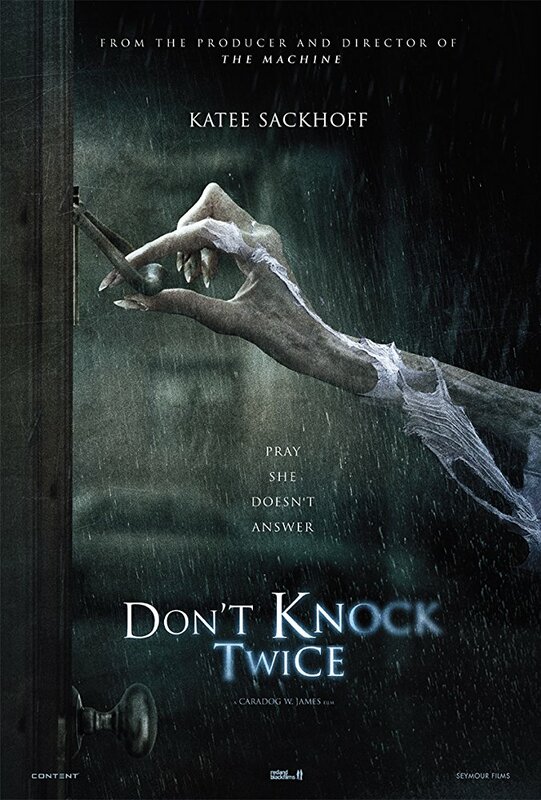 Don't Knock Twice isn't going to blow your mind, it's not going to be a cherished favourite in anyone's collection, and it has a very low body count for this type of film, but it is fun enough that I can't see anyone who sees it begrudging it as time truly wasted. If I will say the same about the PSVR game after having played it I can not say, but fingers crossed.